The stock market crash of October 1929 in New York was still a very fresh memory when baby Christopher was born a few weeks later on Friday, December 13 in Toronto, Ontario. His father, John Plummer, was secretary to the Dean of Science at McGill University in Montreal. His mother was Isabella Mary Plummer, whose grandfather, Sir John Abbott, who had been the mayor of Montreal and later the third Prime Minister of Canada. Christopher Plummer won a Best Supporting Actor Oscar® for his role in Beginners. He had previously won a Golden Globe for the same role. Learn more about Christopher Plummer. Trailer courtesy of Mongrel Media. 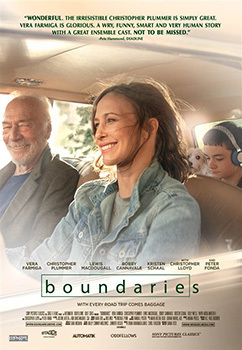 Poster for Boundaries courtesy of Mongrel Media.